A fully modernised rail service with British-built carriages providing faster trains, more seats, free Wi-Fi for all users and tough new performance targets. The new service for rail passengers across East Anglia promises to deliver more than 1,040 new state of the art carriages and cut journey times by an average of 10%. It will also deliver one of the biggest orders for British-built trains – almost £1 billion for 660 carriages from the Bombardier factory in Derby – as part of a contract that will secure 1,000 jobs into the next decade. The government today announced it has awarded the franchise to Abellio East Anglia, who will oversee this £1.4 billion investment to local rail services. a host of new ticketing initiatives, starting in October 2017, including new offers for part time users and those who don’t travel every day. View an interactive map of individual line benefits. By 2021, there will be more than 32,000 more seats on services arriving at London Liverpool Street in the morning peak, while the new franchise will introduce 1,144 additional weekday services – an increase of 13% – to stations including Cambridge, Norwich, Stansted Airport, Lowestoft, Southend and London Liverpool Street. We are making the biggest investment in the railways since the Victorian era. 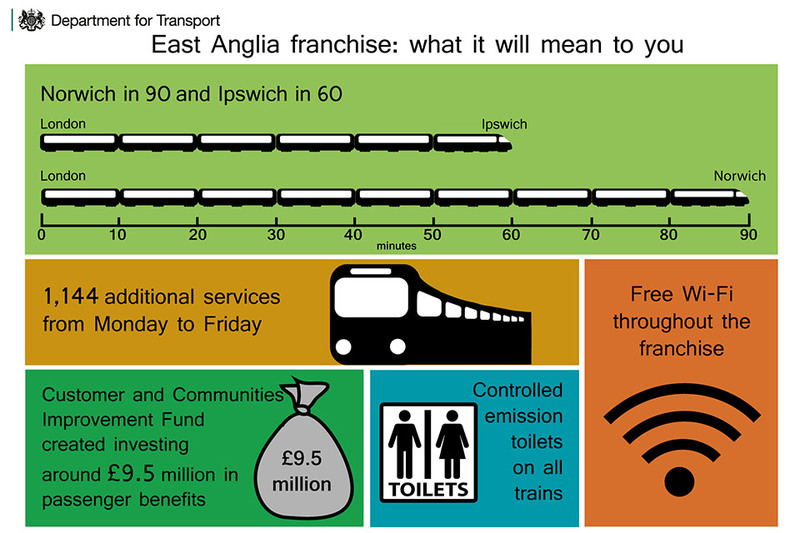 By awarding this franchise to Abellio East Anglia we will improve journeys for people in East Anglia. Abellio’s decision will ensure our train building industry in Derby remains strong. This is part of our plan to make an economy that works for everyone – not just the privileged few – by ensuring prosperity is spread throughout the country. This is great news not only for Abellio but for the whole of East Anglia. We are pleased to become preferred bidder to deliver a transformation in rail services across the region. It will enable us to build on the successes of the 2 short East Anglian franchises we have run since 2012, and we commend the DfT in running a transparent and rigorous procurement process. Our plans will greatly improve our customers’ experience with faster and more reliable journeys on new trains with higher frequencies and reduced journey times, to support the socio-economic well-being of East Anglia, one of the country’s most successful and fastest growing areas. We’re delighted to be chosen, pending final contract signing, as the preferred supplier for new trains for the East Anglia franchise. We look forward to working with our customer the Abellio UK, to support them in transforming rail services throughout the region and delivering an enhanced customer experience through the provision of new trains. It’s a great endorsement of Bombardier’s next-generation AVENTRA train family, which offers maximum flexibility, to serve many different market requirements from metro to intercity. More than 97 million journeys are made on East Anglia’s rail network each year, with around 4,300 trains every week serving London commuters, the regional hubs of Cambridge, Ipswich and Norwich, leisure travellers to Stansted Airport and coastal and rural resorts around the region. The new franchise will run from October 2016 until 2025.
franchise after submitting a compelling, deliverable, and value for money bid.